With housing affordability reaching its lowest point in over a decade, Americans have grown increasingly concerned about where they can expect to rent an apartment. Wage and job growth are continuing, but the glut of affordable housing across the country will have a real impact on renters for the foreseeable future. With this in mind, we decided to take a closer look at just how far the nationwide average effective rent will take an individual looking to move into a new apartment. We tried to focus on the needs of a person looking to get the highest overall quality of life for their monthly rent payment. 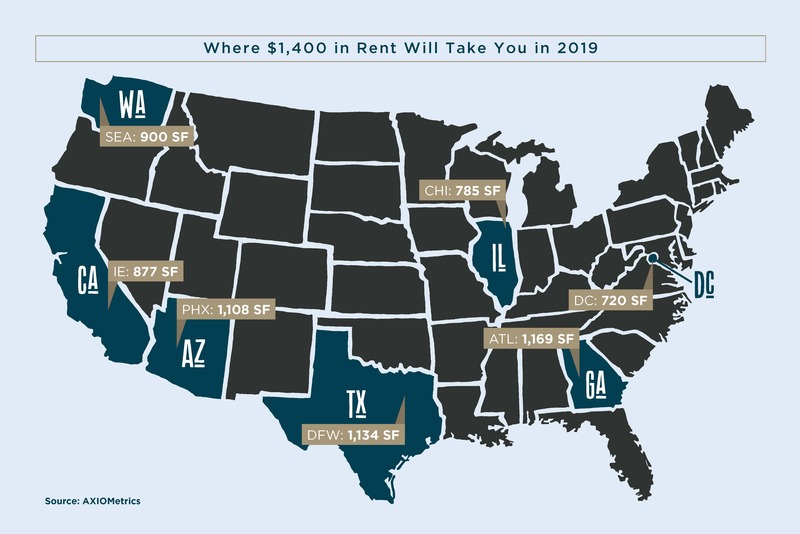 In the final quarter of 2018, nationwide average rent was just under $1,400 per month. Here’s a closer look at how much rental space that amount gets you per month in seven of the most popular markets across the United States. More renters are preferring Sandy Springs for its convenient proximity to both the suburbs and Atlanta’s urban core. Constructed in 2017, Northridge Vista is a great example of the recently built properties vying to meet this demand. Amenities like pet parks, a high-end fitness center, and a spacious resident’s lounge are just a few of the modern perks available to residents, with the intention of creating an urban core experience away from the metro’s urban core. Sandy Springs is in a unique position compared to the rest of Atlanta’s multifamily market. Rent in the area generally exceeds the metro average of $1,176 but still trails behind the costliest submarkets in the metro like Midtown Atlanta, where rent approaches $1,800 per month. This isn’t surprising considering that much of the recent construction in this area was designed to attract residents who had recently been priced out of Atlanta’s increasingly expensive urban core. Originally built in 1973, the recently renovated property is a great example of the latest trend of value-add projects that have become increasingly popular in the submarket. Hardwood flooring, stainless-steel kitchen appliances, and easy access to Interstate 88 are a sample of the key benefits the property has to offer. A nearby local zoo and family aquatic center further emphasize the property’s appeal for families who are looking to settle down but who aren’t enamored with the idea a mortgage payment. Residents also enjoy stunning views of the adjacent Mastodon Lake. Proximity to Chicago and modest operating costs has made Aurora an attractive landing spot for large employers like MetLife and Farmers Insurance. Strong employment has kept occupancy high and the apartment market tight, resulting in limited new construction in the area. Despite a recent trend of redevelopments and value-add projects stoking rent growth, rent in the submarket still trails the metro average of $1,472. Thanks to high-tech conveniences and modern design choices, Mockingbird Flats highlights the significant value to be found just outside of Dallas’s urban core. Constructed in 2012, the multifamily property boasts many modern amenities including a Wi-Fi café, car charging stations, a dedicated tanning room, and LEED certified operations. The property is also close by to the local DART Rail, connecting residents to the bevy of live-work-play opportunities available in Dallas’s hippest neighborhoods. East Dallas is unique with regard to multifamily housing as it serves as the middle ground between booming but pricey neighborhoods like Uptown and the older apartment stock found in neighborhoods further out from the metro’s urban core. Demand for affordable housing has kept occupancy tight across the metro despite a wave of new assets coming online in or adjacent to historically depressed areas. Despite rent growth accelerating through the second half of 2018, high-end multifamily properties in the submarket still trail those found in Downtown and Uptown Dallas by several hundred dollars. Centrally located in one of Inland Empire’s most attractive submarkets, Laurel Heights offers a quiet and comfortable living space equipped with widely sought-after amenities. Spacious floor plans, immaculate landscaping, and classic interior design touches like quartz countertops aren’t the only things the property has to offer convenience- and comfort-minded renters. The fact that the apartment is only a few miles from SR-60 and SR-91 is especially appealing for renters seeking access to job hubs like Los Angeles and Orange County. The fact that average effective rent across the Inland Empire metro exceeds $2,000 speaks to the value available throughout the Riverside submarket. Commuting young professionals are especially attracted to Riverside thanks to its revamped public parks and transportation, as well as a strong emerging arts and culture scene. The presence of premier academic institutions like UC Riverside have also helped to diversify employment throughout the metro, sustaining demand for both new, state-of-the-art multifamily assets as well as value-add opportunities. Chazal Scottsdale is nestled squarely in the South Scottsdale submarket, between the employment hubs and nightlife of Old Town Scottsdale and the lively college atmosphere of Downtown Tempe. Luxury amenities available to renters at Chazal Scottsdale include heated pools, waterfront biking paths, and a state-of-the-art fitness center. The apartment complex is also ideally situated close to North Scottsdale, home of major employers like American Express and GoDaddy. South Scottsdale has been a major focus for multifamily development thanks to strong population growth and its status as the metro’s leading office-employment hub. Many of these developments have been Class A and A-plus developments located close to retail centers like the Scottsdale Fashion Square. Additionally, strong demand has driven both development activity and value add projects along the border between Tempe and Scottsdale, which conveniently runs along Loop 202. Mature trees surrounding Foster Creek and the property’s striking courtyard garden highlight the natural beauty of the Pacific Northwest. Residents enjoy breathtaking mountain views, as well access to appealing lifestyle amenities like a stylish resident clubhouse and a spa. The property is also located adjacent to Interstates 5 and 45, opening up a variety of commute options for residents working in Seattle, Tacoma, and across the remainder of the metro. The SeaTac/Burien submarket benefits from a large and quickly growing population that continues to generate demand for multifamily. Much of this population growth can be attributed to the lack of affordable housing in Downtown Seattle and other popular submarkets, where effective rent is well over $2,000 per month. A recent slowdown in deliveries across the SeaTac/Burien submarket has driven a wave of renovations and value-add projects, many of which are designed to attract young professionals and families who have been priced out of Seattle’s bustling urban core. Comfortable and scenic, Capital View offers residents several incentives to work, live, and play near the nation’s capital. Quick access to public transportation, newly renovated kitchens, and plenty of extra storage are a sample of perks that makes Capital View an intriguing possibility for renters interested in commuting to and from Washington, D.C. The property also fits into the area’s iconic colonial revival aesthetic thanks to an attractive red brick exterior. Rents in the Hyatsville submarket are among the most reasonably priced in the entire metro. Despite the area being adjacent to multiple metro stations and its proximity to the District, effective rent in the area largely falls below the metro average close to $1,700, in part due to aging multifamily stock. As a result, occupancy has been historically very high in the area, highlighted by the fact that about two-thirds of the entire population is currently renting. The presence of nearby University of Maryland, however, has encouraged apartment developers to build new multifamily projects close to campus.